Art Fair Residency 2019 — M. David & Co. The residency includes trips to the Volta Art fair and the Armory Show with Michael David. This is an amazing opportunity to view the works of contemporaries from all over the world with commentary by Michael and come away with new perspectives, a very exciting time to be in New York! The goal of these residencies is to provide you the time to focus on your work away from the distractions of day-to-day routines and to participate in the shared energy of like-minded artists as you take your work to new levels and prepare for your exhibition at M. David & Co.
Michael David works with participants via Skype and or phone for at least two, hour-long sessions along with email updates individually and for the group prior to your arriving at the residency. This allow Michael to gain a better understanding of you, your work and goals to maximize your experience. He is actively involved and available on a consistent basis for dialogue about your work during the time of the residency. These residencies offers the speed, intensity and energy of NYC and the exposure to the NYC art world. The gallery and studio are great places to work with others who share the same level of seriousness and professional practice. Those admitted to this residency will be selected because their work is already at a level ready to exhibit and should be prepared to bring work in progress as well as work to develop. Admission to this program will be done by a digital portfolio and website review. Studio/Gallery spaces will be provided at 56 Bogart Street. 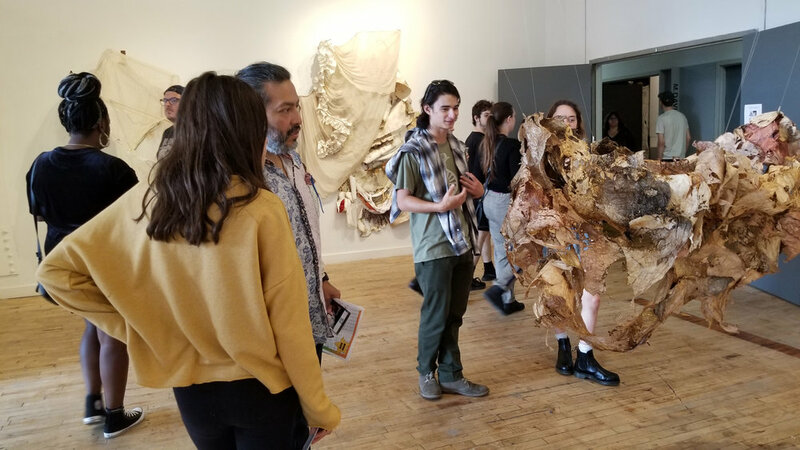 The residency includes talks and crits by guest artists including Paul D’Agostino with an opportunity to dialogue about your work. The residencies, I believe, which have been the most successful, were based on conversations I had with each participant first, finding common threads, passing it through my own passion, then creating a loose architecture a structure and theme for each participant to interpret and to run with. I then shared everyone’s emails in the hope each participant would share their thoughts with each other before the residency. One of the aspects of the magic of this program is the support and collaboration between the artists involved. We come to a project prepared for one thing and often times it can change in a moment from seeing our reflection in each other. The themes for the last two residencies were the Exquisite Corps and Folded.... this one is called Hurt. One of the great benefits of my recovering from my broken leg this December was spending three weeks and having the blessing of having my son to care for me and live with me. We talked in ways we never had before and I got to see what a beautiful man he had grown into. I listened to his music, talked about life, his and mine. He would play Cardi B, Lorde among many other artists I was not familiar with (which I came to really enjoy) for me and I would play Bowie for him. Along the way I played the live version of Hurt by Nine Inch Nails and Bowie. He asked me if I knew the Johnny Cash version, I said I did but never really paid attention to it. Then I watched the video of it and my mind was blown and my heart made full. It's a perfect interpretation of the Trent Reznor song by Johnny Cash and perhaps the most beautiful music video ever made. Cash was soon to die and the producer (known best for being Co-Owner of Def Jam Records and one of the masterminds of the commercial success of Hip Hop and seemingly strange bed fellows) Rick Rubin took Cash into the studio to record this song - about redemption - regret and some attempt at absolution. I often talk about the importance of subject and object- how the narrative you are telling is made stronger, if the process - the materiality of how you tell that narrative is actualized through that process and are one and the same. This crucial relationship is evidence of the artist’s deeply secular spiritual commitment, struggle and practice over their lives to speak their truth. It is my firm belief this commitment is the basis of all great work- the evidence of the passion, the conviction, the bravery and the uncompromising struggle to share who we are with each other. So in this case we have Cash dying, singing a song that could have been written by him or for him (it is better that he didn't write it or it wasn't written for him, because the deepest truths are universal) the subject and the object are so painfully and beautifully aligned - decades of a life of remorse, regret, infidelity, his underlying struggle with faith and Christianity, heroine abuse and a desire for redemption all made perfect in the closing shot - of his hands closing the piano lid- a moment of perfection, of high art. The fragility in Cash's voice, his age, his health, his life lived are the perfect union of subject and object - if truth is beauty and beauty is truth - this is beauty of the highest level and why I preach the importance of your own relationship to your "material " - the power of subject and object. 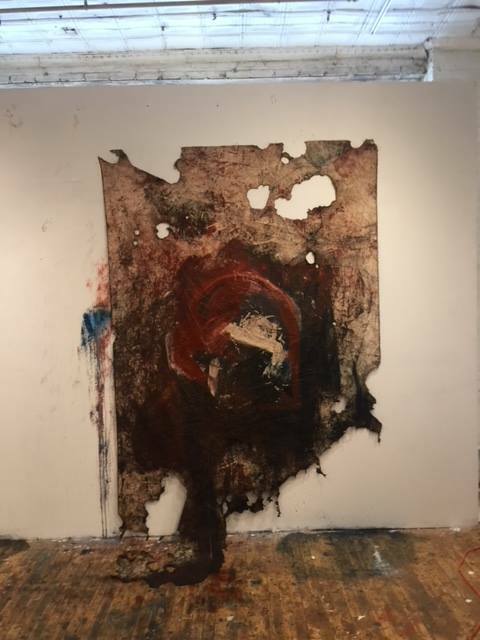 So my challenge to for this workshop and anyone who might come across this letter is to pick a work of another artist as Rubin picked Reznor's song for Cash- it could be painting, sculpture, literature, film, music, that already relates deeply to the essence of who you are, and create of work in your own voice based on that. I challenge you to dig deep, take risks, dare to be great, dare to be to be your most honest and profound self. 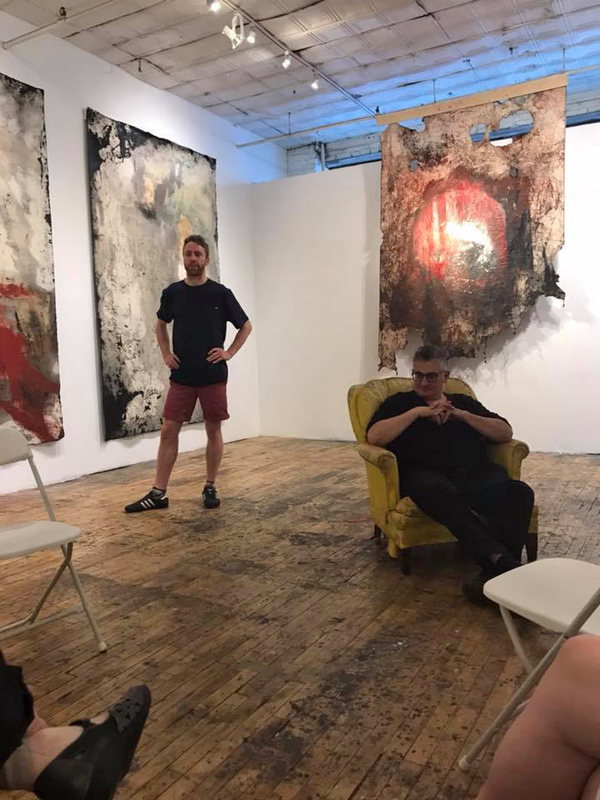 Paul D’Agostino is an artist, writer, translator, curator and professor living in Bushwick, Brooklyn, where he has been producing and hosting art exhibitions and critical discussions at Centotto Gallery, situated in the living room of his shared loft, since 2008. He holds a Ph.D. in Italian Literature and is currently a member of the part-time Art Faculty at Parsons The New School for Design, and MFA Writing Advisor at the New York Studio School of Drawing, Painting and Sculpture. He has also taught language, literature, cinema and interdisciplinary studies courses in the Department of Modern Languages and Literatures at CUNY Brooklyn College, the Department of Romance Languages at Fordham University, and the Italian Department at Rutgers, The State University of New Jersey. Crits and discussions on your work, including professional development by Michael David will also be a part of the residency. Time allowing; visits to galleries and artist studios will be arranged with optional participation. A day at the Volta Art Fair is an important part of this residency. You are of course, free to spend your days doing anything you want and to visit more on your own. This residency will include 6 to 8 artists only. If your submission is not accepted this go round, it will be considered for future dates. The vision for each residency is unique. Michael David has been exhibiting internationally since 1981, first with the Historical Sidney Janis and then with M.Knodler &Co for over two decades. Exhibiting widely throughout the United States for 30 years, and has been the subject of much historical and curatorial acclaim. His work is included in the permanent public collections of the Museum of Modern Art in New York, the Guggenheim Museum in New York, the Museum of Contemporary Art in Los Angeles, and the Los Angeles County Museum of Art, among several prominent private collections. In the last decade David established the Fine Arts Workshop in Atlanta working with artists on an immersive one to one basis helping artists to develop their voice and professional practices, helping artists find exhibition opportunities and helping them prepare to take their individual expressions. In the last five years David established, Directed and Curated two of the most successful Galleries in Brooklyn; Life On Mars and M. David & Co. including exhibitions and residencies. The residency has proven to be an important life changing experience for participants. The residencies I have engaged in with Michael David have had a profound and positive impact on my work. Michael has an uncanny knack for entering the process and addressing obstacles with each artist. There is nothing more useful in a teacher and a mentor than their ability to help you unblock yourself, without hindering the creative process. He is a master in creating an environment among the artists that is inspiring without being competitive, truly collaborative while identifying each person's voice. I am a devotee! My experience with Michael David’s residency could not have been more positive. Not only was there instant like and respect as colleagues, but an instant friendship. That lead to a level of professional interaction and discussions that were honest, critical, provoking, and insightful without worrying about feelings, because the intent is for the better good and stimulation of pushing one’s practice. Michael has been involved in the Visual Arts for over 40 years (Michael I hope you don’t mind my aging you…lol). That means he has not only been successful in his personal practice, but has been involved, seen, acquired great knowledge, and has been interactive in the contemporary art world as we know it -That is Invaluable. Thank you Michael. I look forward to working with you again and again. The feedback and input from Michael have been invaluable. Michael helped me hone-in- on a few key words, phrases and concepts in a succinct and precise way that became foundational in building forward with my work. I now have those utterances to live with in the studio and have found myself doing more research; delving into artists who have worked in similar genres to gain deeper historical insights and I am continually employing concepts I relate to and I believe can be of value, into the work. The residency gave Michael the time to look and engage with me over days, in a way which goes beyond a crit from not only a trusted eye but someone who “gets you” and can reach in and give you a clarity of vision. The residencies are built so that participants are working individually, with not only feedback from Michael but he also gathers everyone in these small residencies for discussions and brainstorming sessions as well so the feedback from others and the camaraderie and bonds become an integral part of the experience. 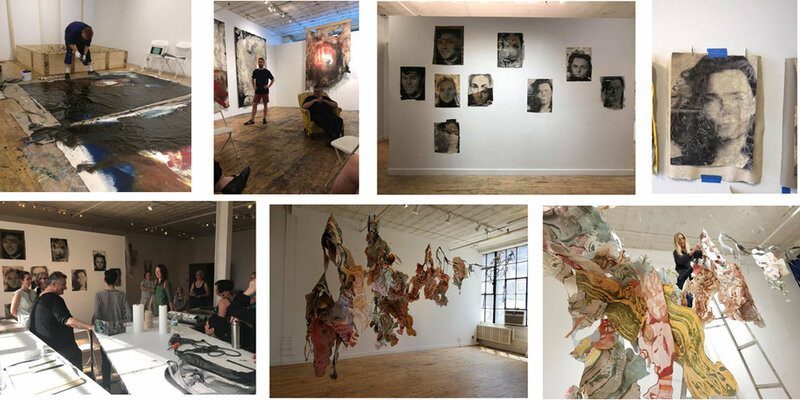 Additionally, time in Bushwick, in the fantastic atmosphere, being around other artists and the ability to do studio and gallery visits is an exciting dynamic along with the exhibition opportunities. Being part of an exhibition at M. David & Co. and M. David Studio is a fantastic way to meet artists in the community and see your work realized in these gorgeous spaces.